If you’re like most of us, you associate the term, “Dengue Fever,” with a far-off, remote land. Probably somewhere near Africa. Nowhere near Hawaii. But, that’s not necessarily the case, at least this year. So far, Dengue Fever has been confirmed on the Big Island, and officials are scrambling to eradicate the disease before it gets a stronghold. 1. This Year’s Outbreak Isn’t the First: According to the Honolulu Star Advertiser, in 2001, 122 people contracted Dengue Fever during the first Hawaii outbreak in 56 years. That year, the disease hitchhiked its way to Hawaii on a traveler or two. 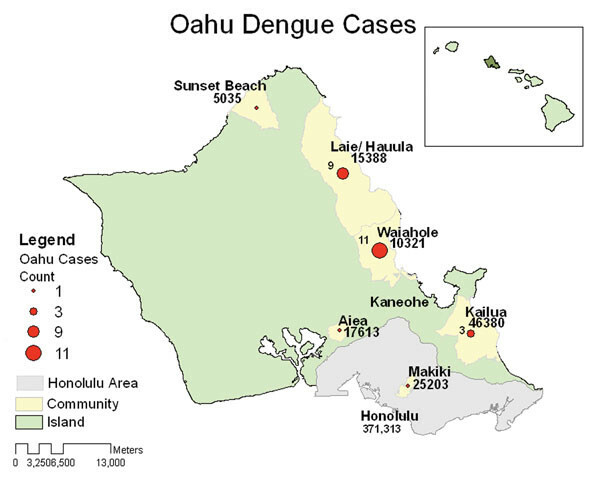 Maui was hardest hit, with 92 cases, but Oahu and Kauai also reported cases of Dengue Fever. In 2011, which was the last outbreak, four people contracted Dengue Fever on Oahu. In 2001. 122 people contracted Dengue Fever on Maui, Oahu, and Kauai. 2. The Big Island Has 27 Confirmed Cases: Just recently, the affected number of people affected by Dengue Fever on the Big Island has risen to 27. Of those cases, 19 are local residents, two of which are children, and eight are visitors. The State decided to close Hookena Beach Park in South Kona because officials believe some of those affected might have visited the spot. 3. The Symptoms Can Be Painful: Symptoms can be mild to severe, but most cases involve headache, rash, nausea, aches and pains in muscles and bones. The symptoms usually last for about a week. 4. You Can Protect Yourself: Dengue fever is spread by humans farther than mosquitoes, which means people are key to stopping the virus in its tracks before it spreads to the Neighbor Islands. Mosquitoes have about a four-week life cycle, so if the mosquito doesn’t bite anyone during this time, it will die and take the disease with it. To deter bites, people can take preventive measures like avoiding mosquito-ridden areas. If that is not possible, people should protect themselves with long-sleeve shirts and pants, and bug repellent containing DEET and “get out of there sooner than later.” This is in addition to preventive measures such as spraying and eliminating standing water. Health workers like this one are busy trying to learn where the mosquitos first bit those affected on the Big Island. 5. State Officials Are Working Hard To Eradicate the Disease: In addition to closing Hookena Beach Park, officials are spraying for mosquitos at the park and assessing its effectivenenss. Other officials are also taking proactive measures to prevent further outbreaks. The Kamaaiana United to Protect Aina (KUPA) board of directors just passed a motion to purchase fogging equipment to pass out to area residents. Booking your travel through Hawaii Aloha Travel can also help you avoid areas that may be considered high-risk. Ask your travel professional about Big Island activities that keep you away from affected towns and beaches. Although the risk is still quite small, it’s important you be aware of Dengue Fever and its presence here in Hawaii. That way, you can enjoy your vacation without worrying about contracting the disease while you’re here.